In case you haven't heard, the U.S. healthcare system will be using ICD-10 codes on Oct. 1. To help those physician practices that are just starting to prepare, Centers for Medicare and Medicaid Services (CMS) has put together a quick guide. Clearinghouse services – Some providers who are not ready could benefit from contracting with a clearinghouse to submit claims. Clearinghouses cannot help you code in ICD-10 codes unless they offer third-party billing/coding services. Training for clinical staff—e.g., physicians, nurse practitioners, physician assistants, registered nurses—should focus on documentation, new coding concepts captured in ICD-10. Training for coding and administrative staff—e.g., coders, billers, practice managers—should focus on ICD-10 fundamentals. New forms – It is crucial to update hard-copy and electronic forms (e.g., superbills, CMS 1500 forms). Systems upgrades – Double check that you’ve identified all systems that use ICD codes and need upgrades (e.g., practice management systems, electronic health record (EHR) products). The best way to ensure your systems are ready is to test. Focus on your highest-risk scenarios like claims processing and the diagnoses you see the most often as you test any system that stores, processes, sends, receives, or reports diagnosis code information. Consider the volume of conditions and those that account for most of your revenue. Look at recent medical records for patients with these conditions and try coding them in ICD-10 for practice. Do the records include the documentation needed to supply select the correct ICD-10 code(s)? Use any cases of insufficient documentation to create a checklist for clinicians to consult. 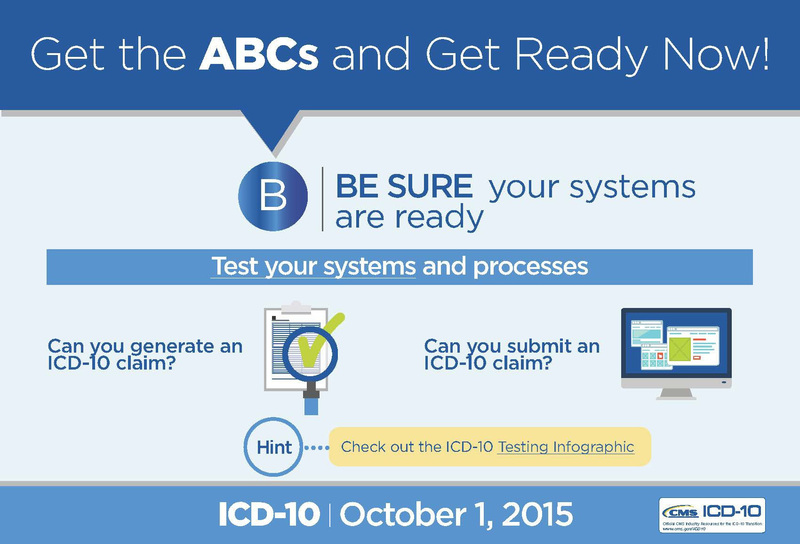 For more information about testing your systems, check out the ICD-10 Testing Infographic. 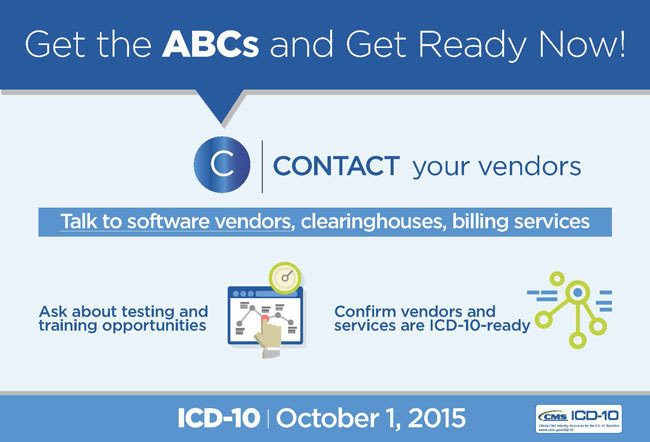 If you aren’t sure your systems are ready for ICD-10, contact your vendors and other business trading partners. Check for testing opportunities at the website of the Cooperative Exchange, an association of clearinghouses. I sincerely hopes this helps. Please let us know what does and doesn't. Hopefully by sharing information we can make this easier. ICD-10 Preparation: Is CMS as helpful as it can be?